Harare (/həˈrɑːreɪ/; officially Salisbury until 1982) is the capital and most populous city of Zimbabwe. The city proper has an area of 960.6 km2 (371 mi2) and an estimated population of 1,606,000 in 2009, with 2,800,000 in its metropolitan area in 2006. Situated in north-eastern Zimbabwe in the country's Mashonaland region, Harare is a metropolitan province, which also incorporates the municipalities of Chitungwiza and Epworth. The city sits on a plateau at an elevation of 1,483 metres (4,865 feet) above sea level and its climate falls into the subtropical highland category. "Forward with Service to the People"
The area at the time of founding of the city was poorly drained and earliest development was on sloping ground along the left bank of a stream that is now the course of a trunk road (Julius Nyerere Way). The first area to be fully drained was near the head of the stream and was named Causeway as a result. This area is now the site of many of the most important government buildings, including the Senate House and the Office of the Prime Minister, now renamed for the use of the President after the position was abolished in January 1988. Salisbury was the capital of the self-governing British colony of Southern Rhodesia from 1923, and of the Federation of Rhodesia and Nyasaland from 1953 to 1963. Ian Smith's Rhodesian Front government declared Rhodesia independent from the United Kingdom on 11 November 1965, and proclaimed the Republic of Rhodesia in 1970. Subsequently, the nation became the short-lived state of Zimbabwe Rhodesia, it was not until 18 April 1980 that the country was internationally recognised as independent as the Republic of Zimbabwe. In the early 21st century Harare has been adversely affected by the political and economic crisis that is currently plaguing Zimbabwe, after the contested 2002 presidential election and 2005 parliamentary elections. The elected council was replaced by a government-appointed commission for alleged inefficiency, but essential services such as rubbish collection and street repairs have rapidly worsened, and are now virtually non-existent. In May 2006 the Zimbabwean newspaper the Financial Gazette, described the city in an editorial as a "sunshine city-turned-sewage farm". In 2009, Harare was voted to be the toughest city to live in according to the Economist Intelligence Unit's livability poll. The situation was unchanged in 2011, according to the same poll, which is based on stability, healthcare, culture and environment, education, and infrastructure. In May 2005 the Zimbabwean government demolished shanties and backyard cottages in Harare and the other cities in the country in Operation Murambatsvina  ("Drive Out Trash"). It was widely alleged[weasel words] that the true purpose of the campaign was to punish the urban poor for supporting the opposition Movement for Democratic Change and to reduce the likelihood of mass action against the government by driving people out of the cities. The government claimed it was necessitated by a rise of criminality and disease. This was followed by Operation Garikayi/Hlalani Kuhle (Operation "Better Living") a year later which consisted of building concrete housing of poor quality. In November 2017, the biggest demonstration in the history of Zimbabwe was held in Harare in a bid ensure former President Robert Gabriel Mugabe would resign from power. The city sits on one of the higher parts of the Highveld plateau of Zimbabwe at an elevation of 1,483 metres (4,865 feet). The original landscape could be described as a "parkland". The Northern and North Eastern suburbs of Harare are home to the more affluent population of the city including former president Robert Mugabe who lives in Borrowdale Brooke. These northern suburbs are often referred to as 'dales' because of the common suffix -dale found in some suburbs such as Avondale, Greendale and Borrowdale. The dwellings are mostly low density homes of 3 bedrooms or more and these usually are occupied by families. Under the Köppen climate classification, Harare has a subtropical highland climate (Köppen Cwb), an oceanic climate variety. Because the city is situated on a plateau, its high altitude and cool south-easterly airflow cause it to have a climate that is cooler and drier than a tropical or subtropical climate. The average annual temperature is 17.95 °C (64.3 °F), rather low for the tropics. This is due to its high altitude position and the prevalence of a cool south-easterly airflow. There are three main seasons: a warm, wet season from November to March/April; a cool, dry season from May to August (corresponding to winter in the Southern Hemisphere); and a hot, dry season in September/October. Daily temperature ranges are about 7–22 °C (45–72 °F) in July (the coldest month), about 15–29 °C (59–84 °F) in October (the hottest month) and about 16–26 °C (61–79 °F) in January (midsummer). The hottest year on record was 1914 with 19.73 °C (67.5 °F) and the coldest year was 1965 with 17.13 °C (62.8 °F). The average annual rainfall is about 825 mm (32.5 in) in the southwest, rising to 855 mm (33.7 in) on the higher land of the northeast (from around Borrowdale to Glen Lorne). Very little rain typically falls during the period May to September, although sporadic showers occur most years. Rainfall varies a great deal from year to year and follows cycles of wet and dry periods from 7 to 10 years long. Records begin in October 1890 but all three Harare stations stopped reporting in early 2004. The climate supports a natural vegetation of open woodland. The most common tree of the local region is the Msasa Brachystegia spiciformis that colours the landscape wine red with its new leaves in late August. 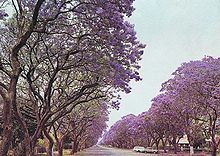 Two introduced species of trees, the Jacaranda and the Flamboyant from South America and Madagascar respectively, which were introduced during the colonial era, contribute to the city's colour palette with streets lined with either the lilac blossoms of the Jacaranda or the flame red blooms from the Flamboyant. They flower in October/November and are planted on alternative streets in the capital. Also prevalent is Bougainvillea. In 1995, Harare hosted most of the 6th All-Africa Games, sharing the event with other Zimbabwean cities such as Bulawayo and Chitungwiza. It has hosted some of the matches of 2003 Cricket World Cup which was hosted jointly by Kenya, South Africa and Zimbabwe. Several of the matches were also held in Bulawayo. Harare also hosted the ICC Cricket 2018 World Cup Qualifier matches in March 2018. Reality TV shows shot in Harare include Battle of the Chefs: Harare, which was screened by the Zimbabwe Broadcasting Corporation. The public transport system within the city includes both public and private sector operations. The former consist of ZUPCO buses and National Railways of Zimbabwe commuter trains. Privately owned public transport comprised licensed station wagons, nicknamed emergency taxis until the mid-1990s, when they were replaced by licensed buses and minibuses, referred to officially as commuter omnibuses (Makombi). The National Railways of Zimbabwe operates a daily overnight passenger train service that runs from Harare to Mutare and another one from Harare to Bulawayo. Harare is linked by long distance bus services to most parts of Zimbabwe. The largest airport of the country, the Robert Gabriel Mugabe International Airport, serves Harare. Football is most popular among the people of Harare. Harare is home to Harare Sports Club ground. It has hosted many Test, One Day Internationals and T20I Cricket matches. Harare is also home to the Zimbabwe Premier Soccer League clubs Dynamos F.C.,Highlanders FC, Harare City, Black Rhinos F.C. and CAPS United F.C.. Residents are exposed to a variety of sources for information. In the print media, there is the Herald, Financial Gazette, Zimbabwe Independent, Standard, NewsDay, H-Metro, Daily News and Kwayedza. Online media outlets include ZimOnline, ZimDaily, Guardian, NewZimbabwe, Times, Harare Tribune, Zimbabwe Metro, The Zimbabwean, The Zimbabwe Mail and many others; however, a number of factors have combined to effectively eliminate all media except those controlled by the state. Therefore, it is difficult to find a news source that is not bribed or influenced by the government. Wikivoyage has a travel guide for Harare. ^ "Mayor 2013–2018". City of Harare. Archived from the original on 15 May 2013. Retrieved 3 December 2013. ^ "Demographia World Urban Areas PDF (March 2013)" (PDF). Demographia. Retrieved 24 November 2013. ^ "Harare". Retrieved 25 May 2015. 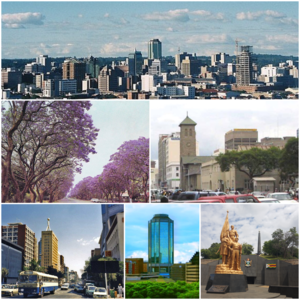 ^ Harare Provincial Profile (PDF) (Report). Parliament Research Department. 2011. Archived from the original (PDF) on 3 July 2013. Retrieved 22 November 2013. ^ "'Harare among world's worst cities to live in'". DailyNews Live. Retrieved 2 August 2018. ^ Hoste, Skipper (1977). N.S.Davies (ed.). Gold Fever. Salisbury, Rhodesia: Pioneer Head. ISBN 0-86918-013-4. ^ kdc. "The Zimbabwe Situation". zimbabwesituation.com. ^ Agence France-Presse. "Vancouver world's easiest city to live in, Harare worst: Poll". The Vancouver Sun. Calgary Herald. Retrieved 8 June 2009. ^ "Least livable cities". Reuters. Reuters. Retrieved 19 August 2016. ^ "Zimbabwe - Rhodesia and the UDI". ^ "Joina City- Harare's New Pride – Inside Joina City- Facts & Figures". Urbika.com. 31 March 2010. Retrieved 17 June 2013. ^ "Joina City Occupancy 3pc". ForBuilder. 16 October 2011. Archived from the original on 9 September 2013. ^ Moyo, Jason (31 May 2013). "Zimbabwe's Changing Spaces". Mail and Guardian. Retrieved 17 June 2013. ^ Koranyi, Balazs (21 February 2011). "Vancouver still world's most livable city: survey". Reuters. Retrieved 28 September 2012. ^ The Economist Intelligence Unit (August 2012). Liveabililty Ranking and Overview August 2012 (Report). Retrieved 17 June 2013. ^ "Zvimba paradise city revealed". Newsday. 23 November 2012. Retrieved 6 June 2013. ^ Madalitso Mwando (27 March 2015). "Zimbabwe Capital Turns to Solar Streetlights to Cut Costs, Crime". allAfrica.com – Thomson Reuters Foundation. Retrieved 28 March 2015. ^ "Mugabe's Borrowdale Brooke neighbour speaks out". 22 June 2014. ^ "World Weather Information Service – Harare". World Meteorological Organization. Retrieved 10 June 2016. ^ "Harare Kutsaga Climate Normals 1961–1990". National Oceanic and Atmospheric Administration. Retrieved 10 June 2016. ^ "Klimatafel von Harare-Kutsaga (Salisbury) / Simbabwe" (PDF). Baseline climate means (1961–1990) from stations all over the world (in German). Deutscher Wetterdienst. Retrieved 10 June 2016. ^ "Station Harare" (in French). Meteo Climat. Retrieved 10 June 2016. ^ "List of previous CHOGMS". Archived from the original on 31 October 2008. ^ "8th assembly & 50th anniversary". Retrieved 25 May 2015. ^ "ICC World Cup Qualifiers 2018 - Super Sixes Match 8 - Zimbabwe v United Arab Emirates - Preview". ^ "What's Next..." reflecting a sense of positive progress". hifa.co.zw. Retrieved 6 June 2013. ^ Dhedheya, Itai. "City of Harare - Twinning Arrangements". City of Harare. ^ Pennick, Faith; Calhoun, Jim (5 August 1990). "Harare newest link: Cincinnati adds sister city in Africa". The Cincinnati Enquirer. Retrieved 21 May 2018. ^ "Harare twins Guangzhou". The Herald. 22 September 2015. Retrieved 23 May 2018. ^ Kalayil, Sheena (2 April 2015). The Beloved Country. Grosvenor House Publishing. p. 29. ISBN 9781781484647.